We fell in love with the place as soon as we stepped in. The tropical garden was so beautiful and maintained very well. 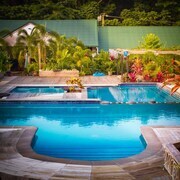 We stayed in over water fale. It’s worth the money! Nice, clean, spacious, private and got the view of paradise. The super king sized bed with memory form top is super comfortable. The restaurant cooks tasty food. We enjoyed our stay here and will definitely come back again next time with our kids. The price for the 2x bungalows was very affordable for decent rooms. Most of the dishes we tried were very delicious but sadly too expensive for our family of 8 that is on a budget. Where to find Cape Fatuosofia hotels near an airport? Where can I find hotels in Cape Fatuosofia that are near tourist attractions? 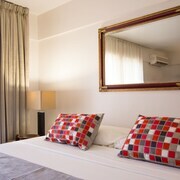 Are you wanting to book a hotel or apartment within a short driving distance of central Cape Fatuosofia? About 2 Expedia-listed hotel and apartments lie within 0.1 kilometres (0.06 miles) of Cape Fatuosofia's center. There are a handful of accommodation options within easy walking distance from the center of Cape Fatuosofia. 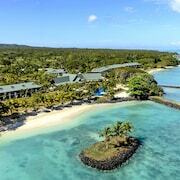 The Le Vasa Resort is a good choice as it is only 3 kilometres (2 miles) away. The Coconuts Beach Club & Resort can be found 30 kilometres (19 miles) from the center of Cape Fatuosofia. Another option is the Sinalei Reef Resort & Spa, which is situated 35 kilometres (20 miles) away. 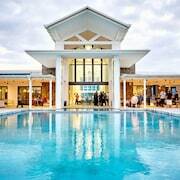 Two other Expedia-listed hotel options here are the Sheraton Samoa Aggie Grey's Resort and the Le Vasa Resort. 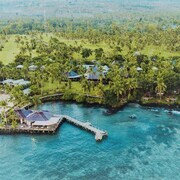 Apia is 30 kilometres (19 miles) to the east of Cape Fatuosofia and is where you'll find Robert Louis Stevenson Museum and Papaseea Sliding Rocks. 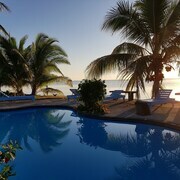 The Tanoa Tusitala Hotel and Insel Fehmarn Hotel are just some of the fabulous Expedia-listed hotel and apartment alternatives in Apia. 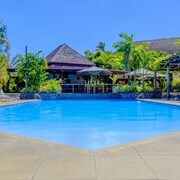 Alternatively, you could stay in Downtown Apia, 30 kilometres (19 miles) to the east of Cape Fatuosofia, where you can pick from the Hotel Millenia Samoa and The Samoan Outrigger Hotel. Regardless of whether you're passing through or spending a few nights in Downtown Apia, you might like to visit the Maketi Fou and Flea Market. If you love sports and like to watch games you might decide to visit Apia Park, which is 30 kilometres (20 miles) to the east of Cape Fatuosofia. Those wishing to find accommodation close to the action can select from the Hotel Elisa or the Pasefika Inn. Cape Fatuosofia offers some great attractions; learn more Expedia's up-to-date Cape Fatuosofia travel guide. What are the most popular Cape Fatuosofia hotels? Are there hotels in other cities near Cape Fatuosofia? What other types of accommodations are available in Cape Fatuosofia? Explore Cape Fatuosofia with Expedia.ca’s Travel Guides to find the best flights, cars, holiday packages and more!